What is 'the groove'? 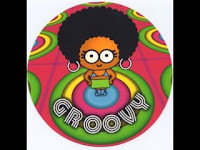 And groovy? The groove on vinyl records, particularly the old 78s rpm jazz records of the 20s and 30s. The depth and width of the groove indicated the speed and beat - something later picked up by early rappers like Grandmaster Flash. Jazz musicians used 'groove' as a term of appreciation and this later became part of pop music culture - the Beatles were famously fond of the adjective groovy. Much later 'groovy' became one of the catch-phrases Austen Powers, a sign that the word had come to symobolise 1960s fantasies of personal liberation and free love.